Can you help one of our special pets in need? Our Furever Foster program just took a beating with several emergencies and very neglected dogs needing immediate attention. Please help if you can. Donations of any size would be so greatly appreciated and are urgently needed now. If you'd like your donation to go to a particular animal, please send us an email following your donation. Please help us provide for and support our "sanctuary" dogs in foster homes. They need both medical care and have ongoing food and maintenance expenses. These dogs are too compromised or too old to make another move and simply need a safe and loving place to live out their lives in peace and comfort in a loving foster home. Thank you for helping us help our furever foster homes who simply need loving, skilled care for the remainder of their lives whether it is days, weeks, months or years. Monte: Came with severe health issues, relinquished by a loving family who could not take care of his growing needs. Monte is enjoying revived health in his furever foster home where his tremors and seizures are monitored and managed. He is 15 years old. Panda: Severe skeletal deterioration, obese and behavioral issues from chronic pain. Panda and her furever foster mom have been on a diet and exercise program. They have lost many pounds and gained much mobility. Pandas pain is managed with lazar treatments an supplements. Her kidneys and liver are too compromised for conventional medications. She and her foster mom help each other in their health goals. 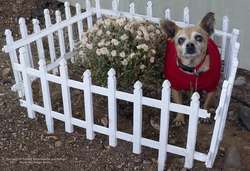 Hank: Hank is blind and 15 years old and has been with us 2 years. Ozzie: We recently lost our precious 17 year old Ozzie but he had some lovely time making friends and exploring his furever foster home. He passed peacefully in the loving arms of his foster mom. 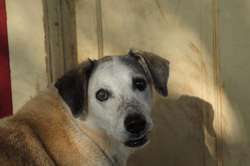 Elliot: Came emaciated, terrified and despondent 12-14 year old. We weren't sure he would make it. He is thriving in furever foster with a disabled woman who finds comfort in caring for him.